Elk are large members of the deer family which exhibit very different behavior than our whitetail deer. 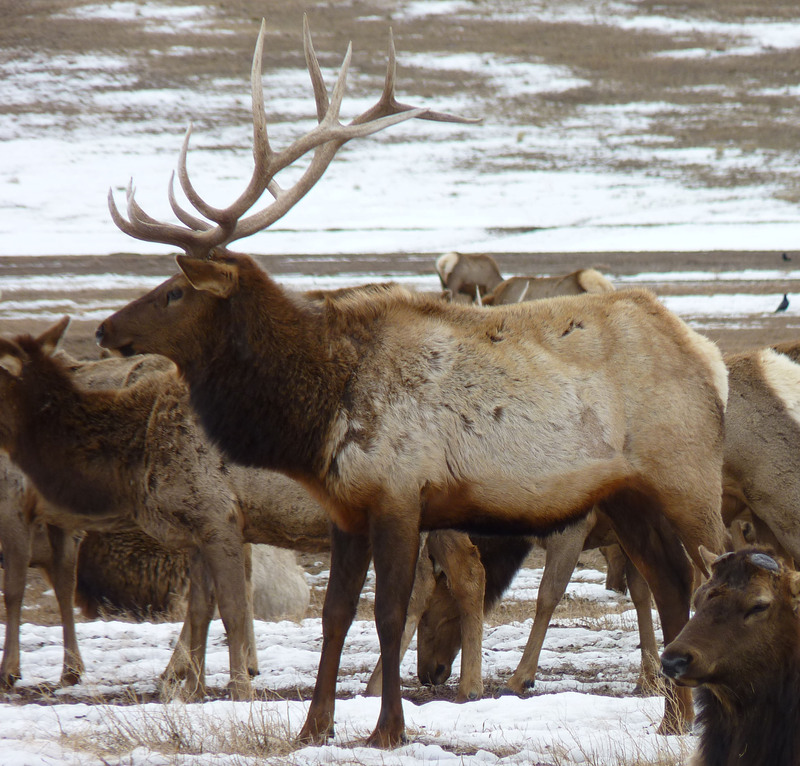 Elk are physically adapted to more open environments and the males gather and defend groups of females during the rut. 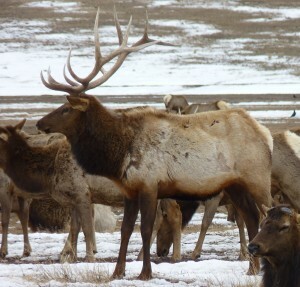 Female elk may vary in weight from 400-500 pounds with bulls weighing 600-800. Some larger bulls may approach 900-1000 pounds in weight. These weights are for the Rocky Mountain subspecies which is the elk we have on the ranch. Elk may live to be 10-15 years of age in the wild. One research study on the Vermejo Ranch in northeastern New Mexico reported that maximum antler growth wasn’t achieved until bulls were 10 years of age on average. The best data available for Texas indicates that 2 “subspecies” of elk occurred in Texas historically. Merriam’s elk occurred in the Trans-Pecos region extending into northern and central Mexico. This population was contiguous with elk populations in New Mexico and Arizona. The Manitoba elk occurred in the northern Texas Panhandle and along the Red River area. These populations constituted the plains elk which also roamed Oklahoma and Kansas into Canada. Eastern elk occurred in Arkansas but no definite records exist for their occurrence in Texas. The Texas Parks and Wildlife Department on their website state, “Historical evidence indicates that elk may have been present over much of Texas.” Elk were considered extirpated in Texas by the late 1800s. All elk in Texas today are of the Rocky Mountain subspecies from transplant stock tracing back to Yellowstone National Park. Biologists have debated back and forth for decades whether elk and red deer are the same species. I was always trained that they were since they freely interbreed and produce fertile offspring. However, about 7 years ago they were once again reclassified as separate species. Legally elk are considered to be livestock in Texas at the present time. This is strictly a political designation as they have also been classified as native big game (which they biologically are) and exotics at various times. Currently the neighboring states of New Mexico, Oklahoma, and Arkansas have free roaming wild herds which are managed and hunted as native big game animals. Elk are primarily grazers but will use browse extensively when grass is not available. This is in contrast to our whitetails which are primarily dependent on browse. A good ratio for calculating range carrying capacities would be that 1 elk equals 3 deer. The elk rut occurs in September and October with single calves being born in May and June. Elk are best known for the bugling of the males during the rut. 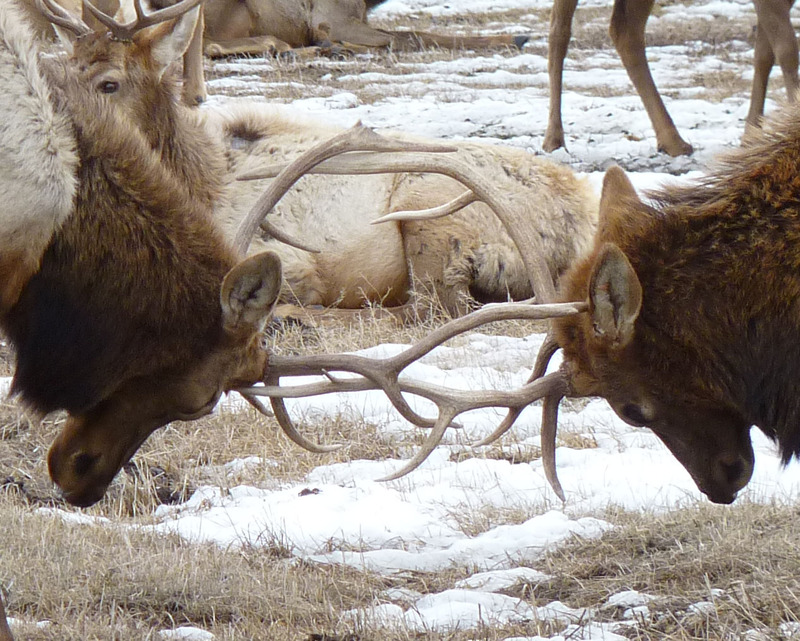 Fights during the rut can be extremely violent with broken antlers and even death often occurring. Most people are unaware that the cows also bugle but it is much less pronounced than the bulls. Both sexes have the remnants of tusks in their upper jaws also referred to as the “ivories”. Sika deer which also trace their lineage back to a common ancestor with elk also have these remnant tusks. In some cases sika deer and elk may interbreed but the offspring are sterile. These offspring are referred to as “Silk”. Some game ranches have deliberately interbred them to produce a larger antlered variant of the sika for hunting. Elk are a fairly easy animal to manage. Given sufficient space with some security cover, grass, and ample water they will usually flourish. The only common primary predator they have in our area is man. This entry was posted in article by Gwen Lanning. Bookmark the permalink.